Ironman Florida 2017 took place last weekend. It’s always a big race, with over 2,300 making the start line and competing for the 40 Kona slots on offer. 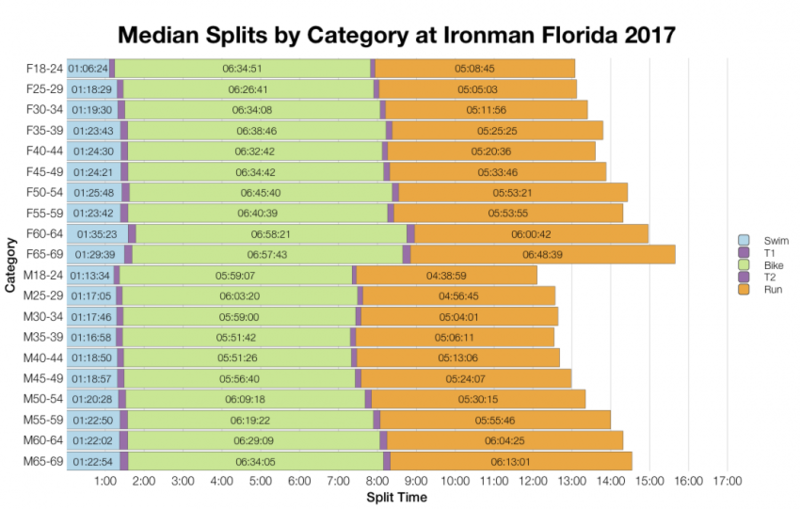 This year’s race looks to have trended slightly slower than usual. Swim and bike distributions from this year’s race are largely comparable from the amalgamated 10-year data. The swim and bike appear to be typical for the Florida course. The run however was significantly slower this year – 20 minutes at the median and a smaller 10-15 minutes for the fifth percentile. 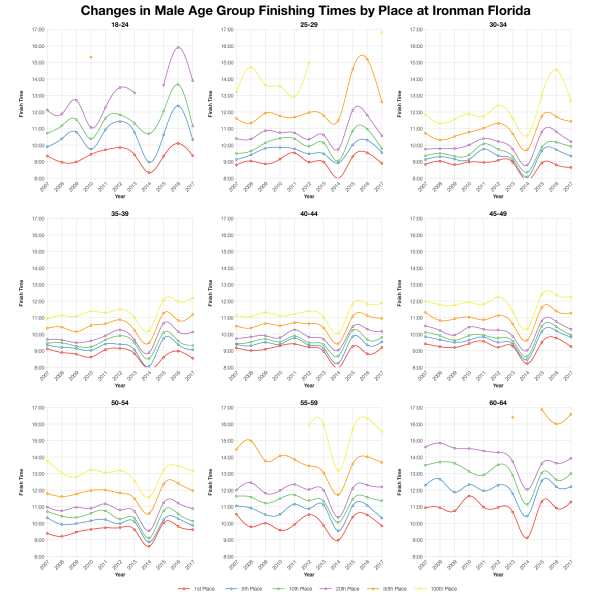 So, across the board slower, but with smaller impact at the front of the age group race. 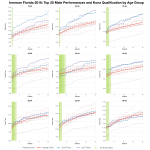 Bearing in mind that older data tends to mix DNS and DNF numbers in the swim and overall, this year’s race doesn’t differ too much from recent events. Despite being slower, the run DNFs are lower than the previous two years and the bike DNF numbers are comparable. Earlier editions of the race have had much lower bike and run DNFs though. I’ll note here that in 2014 the swim was cancelled so figures are absent at that stage. 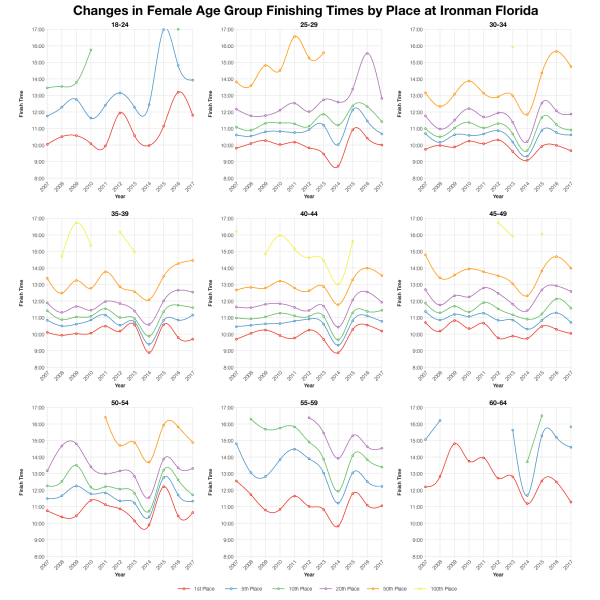 Age group medians normally follow the trends shown in the distribution chart and Florida is no exception. 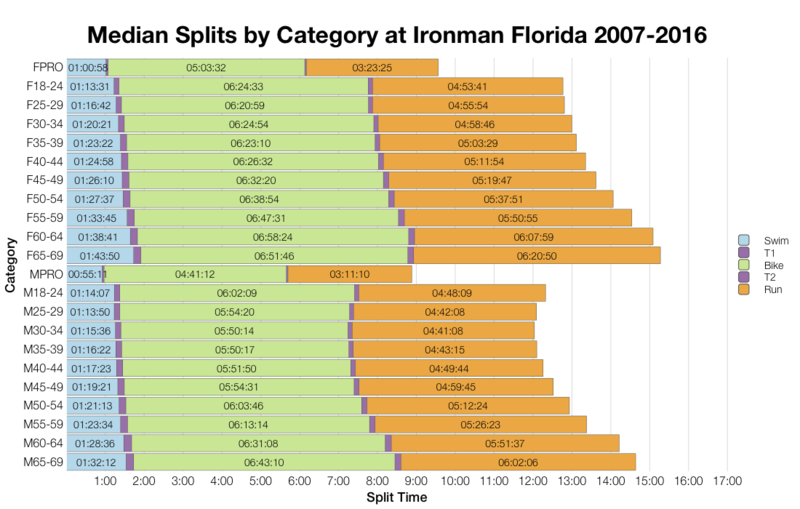 The most notable trend here is the slower AG run times across all divisions. 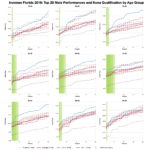 For a US race Florida draws quite a diverse field of athletes. the majority of slots remain in the US or Canada, but here’s a spread to other nations. 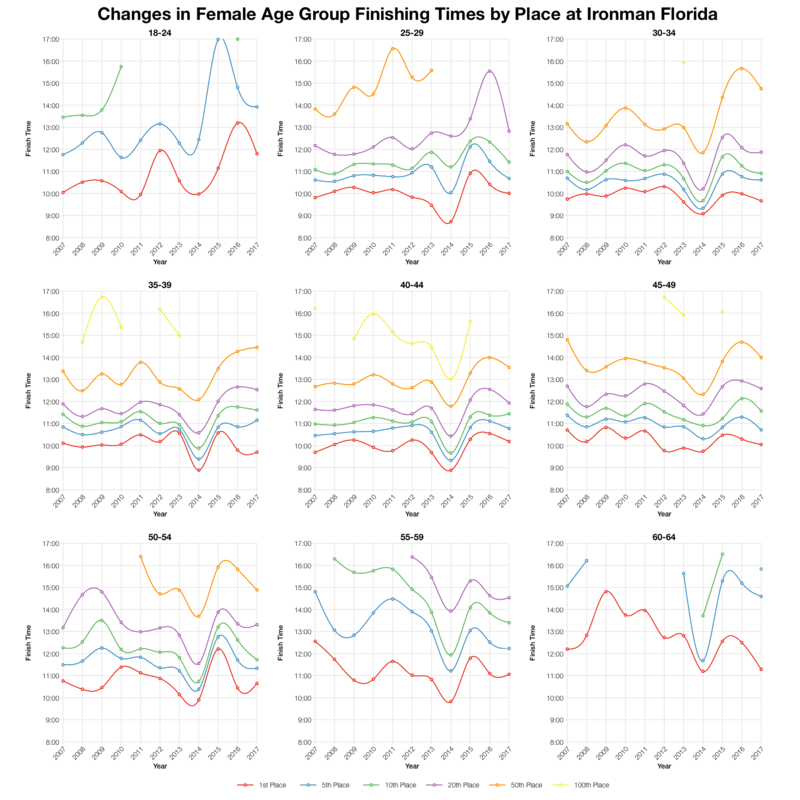 Tracking times for positions over the last decade shows quite a bit of variability on the course. There’s the dip for 2014 when there was no swim. 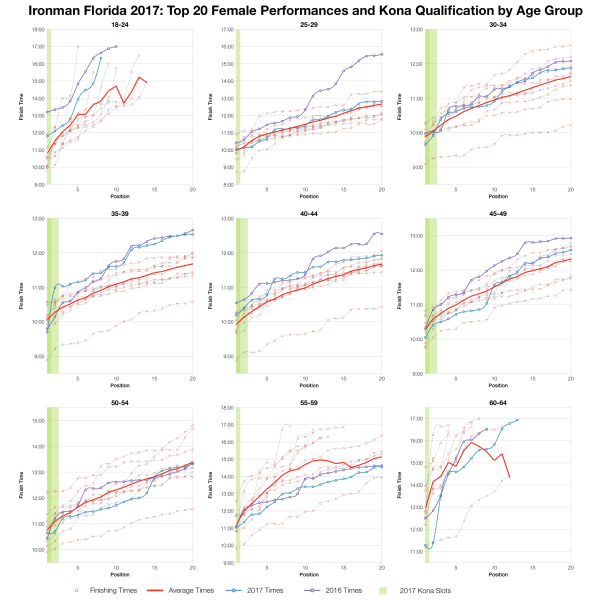 How the 2017 race stands varies with age group and placing, it’s not the fastest year and certainly not the slowest either. For the most part it lies somewhere in line with past results. Faster than the previous couple of years and more comparable with some of the older times. Based on the start list I’ve estimated the allocation of Kona slots and from that the automatic qualifying times for each age group. Roll down would affect these final times so final numbers might have varied. 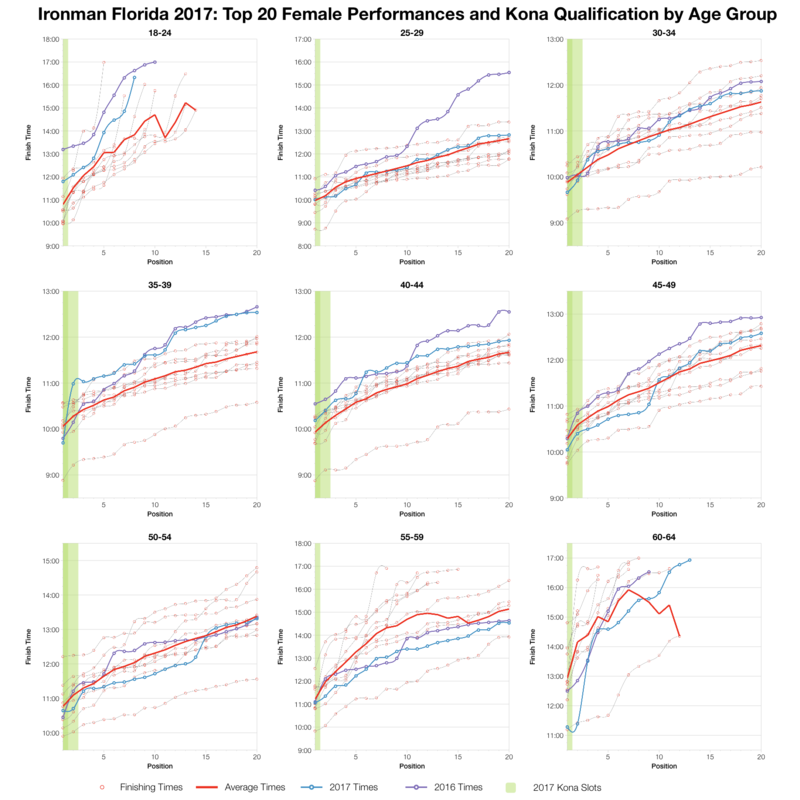 You can check and compare with other races on my Kona qualification page. 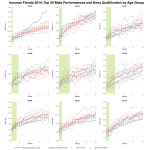 Performances by top twenty age groupers do vary between age groups, but overall the trend is close to the averages. A few divisions dip under, but equally some trend slower. It feels fairly balanced around the average suggesting that while the run trended somewhat slower, the front of race didn’t stray far from the norms. 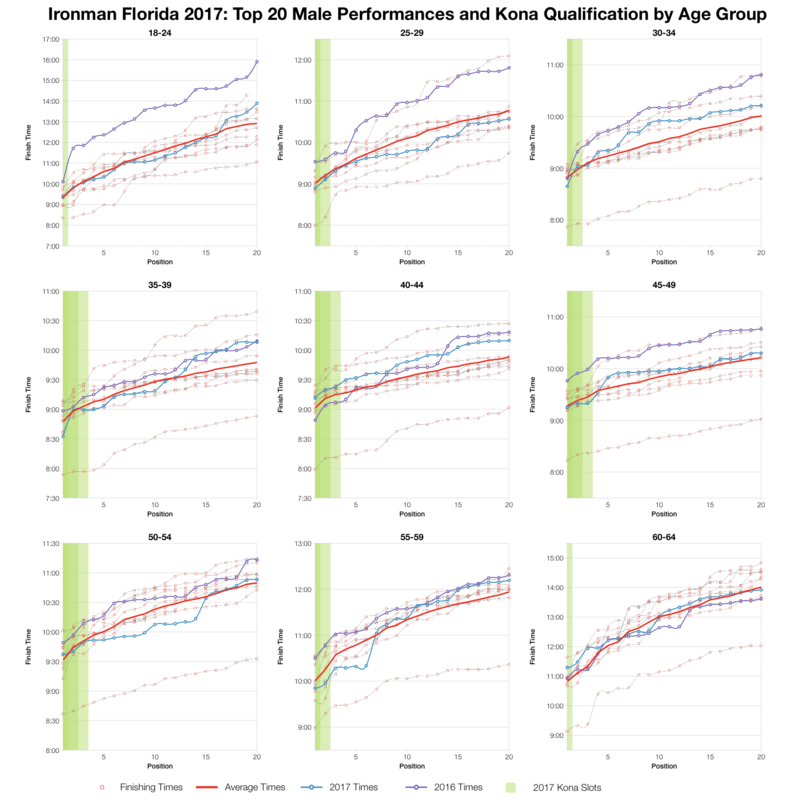 You can access a spreadsheet of the full results and splits from Ironman Florida 2017 on my Google Drive.